Earlier this spring, Women in film SE15 held a three day workshop over three weekends at The Green. Tracey Francis, one of the founders of the group told us: “It was a fantastic collaborative experience. 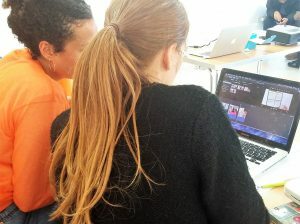 The attendees learnt a lot – including how to use Celtx – and came away with skills and hopefully the confidence to write a script. There were so many brilliant ideas that we hope the attendees take their ideas and writing further. There was definitely award-winning material in the room. Women in Film SE15 is currently running a series of events at the cinema in Deptford, and will be screening here during the Peckham & Nunhead free film festival in September. If you would like to help out with the screening during the festival just email us so you can come along to one of the planning meetings. The group was set up to discuss not only the representation of women in film but also inviting female directors who controlled the shots behind the camera to share this experience. They have a blog to pursue areas that we find interesting, to record the insights that occur around this topic and at times showcase films we have made.